Cooking in my kitchen you will find an assortment of foods at any time of the year. Around the holidays we often get creative to make dishes every member of our family would like. 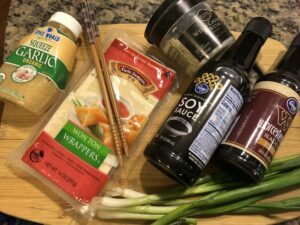 Coming from a melting pot family with a variety of different cultures you will get to have American- Asian style cooking. Never in that order, but who knows what could be on the palate for dinner tonight. I have come across Twin Dragon Wonton wrappers. They are the only products of its kind that are vegan, GMO-Free and made with 100% natural ingredients. I found from other wrappers I have used they were very easy to work with. From mistakes made from other types of wrappers, these do not tear as easily. I like this being I was throwing away more than I was keeping. Frying was super fun because they browned fast and were very easy to fry. These wrappers are a very versatile product to make with your non-traditional Asian dishes the new Asian Fusion. 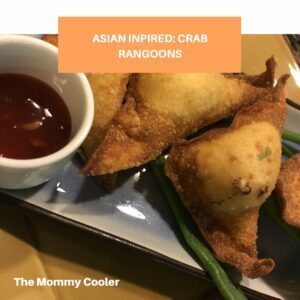 With the Wonton Wrappers I received, I decided to make Crab Ragoons. This has become a favorite of the family when we order traditional Chinese takeout. The ease of this recipe will make you want to make this every chance you get. But don’t take my word for it. Please try it. You will want to try other types of recipes in your kitchen with products from Twin Dragon (JSL Foods). Step 1 1. 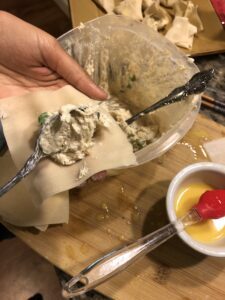 Combine all the ingredients medium-sized mixing bowl except green onion and egg mixture. Combine thoroughly and set aside. Step 2 2. On a flat surface, lay out a wonton wrapper so that it forms 1 triangles (not a square). Wet the edges of the wrapper with egg mixture. Step 3 3. 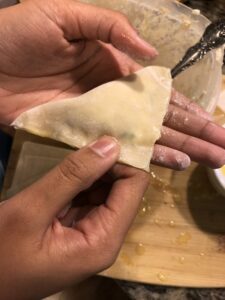 Add 1 teaspoon of filling to the middle of the wonton and spread it in half forming a triangle shape(otherwise the wrapper may break in the middle during deep-frying). Step 4 4. 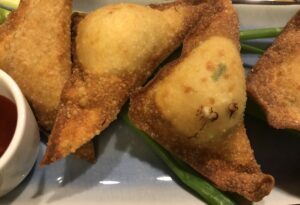 Once you’re ready to cook the Crab Rangoon, heat your pan and add oil for deep frying. 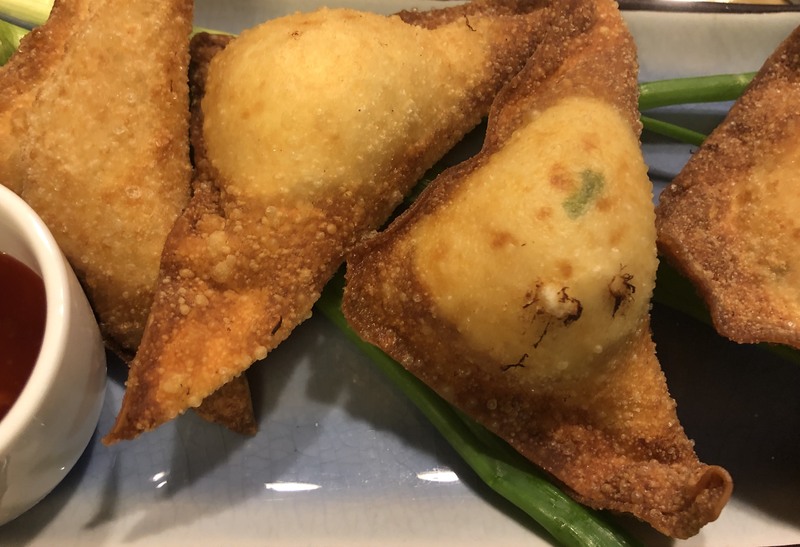 When oil is ready carefully slide in the Crab Rangoon, taking care not to overcrowd the pan. Deep fry until they are golden brown, about 3 minutes, turning once. Remove with a slotted spoon and drain. 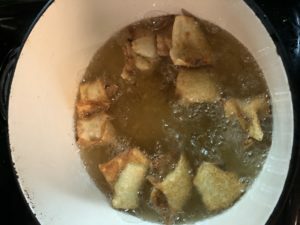 Step 5 Note: If not frying right away keep the completed crab rangoon covered with a damp kitchen or paper towel or to keep them from drying out while preparing the remainder. Step 6 Serve hot with Sweet and Sour Sauce or Spicy Sweet Chilli Sauce. Next time you do your shopping for the week. Make sure you go and look for Twin Dragon Wrappers for Wontons, Potstickers and Egg Rolls at your following Albertsons, Shaw’s, Von’s, Stater Bros, Lucky’s, Food Maxx, Fred Meyer, QFC, Cub Foods, Rainbow Foods, Safeway, Associated Stores, Price Rite, Shop Rite, Winco, Price Chopper and Gelson’s stores! 3 Ways to Bake Up Holiday Magic in the Kitchen!